Monitoring provides feedback from production. 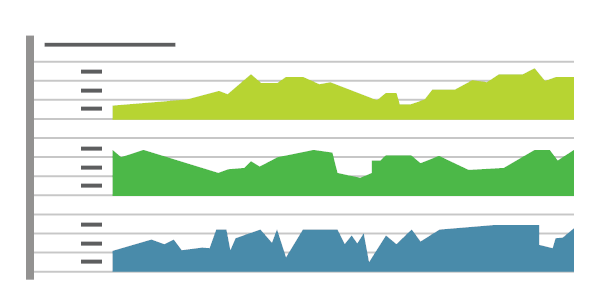 Monitoring delivers information about an application’s performance and usage patterns. One goal of monitoring is to achieve high availability by minimizing time to detect and time to mitigate (TTD, TTM). In other words, as soon as performance and other issues arise, rich diagnostic data about the issues are fed back to development teams via automated monitoring. That’s TTD. DevOps teams act on the information to mitigate the issues as quickly as possible so that users are no longer affected. That’s TTM. Resolution times are measured, and teams work to improve over time. After mitigation, teams work on how to remediate problems at root cause so that they do not recur. That time is measured as TTR. A second goal of monitoring is to enable “validated learning” by tracking usage. The core concept of validated learning is that every deployment is an opportunity to track experimental results that support or diminish the hypotheses that led to the deployment. Tracking usage and differences between versions allows teams to measure the impact of change and drive business decisions. If a hypothesis is diminished, the team can “fail fast” or “pivot”. If the hypothesis is supported, then the team can double down or “persevere”. These data-informed decisions lead to new hypotheses and prioritization of the backlog. “Telemetry” is the mechanism for collecting data from monitoring. Telemetry can use agents that are installed in the deployment environments, an SDK that relies on markers inserted into source code, server logging, or a combination of these. Typically, telemetry will distinguish between the data pipeline optimized for real-time alerting and dashboards and higher-volume data needed for troubleshooting or usage analytics. “Synthetic monitoring” uses a consistent set of transactions to assess performance and availability. Synthetic transactions are predictable tests that have the advantage of allowing comparison from release to release in a highly predictable manner. Real User Monitoring (RUM), on the other hand, means measurement of experience from the user’s browser, mobile device or desktop, and accounts for “last mile” conditions such as cellular networks, internet routing, and caching. Unlike synthetics, RUM typically does not provide repeatable measurement over time. Monitoring is often used to “test in production”. A well-monitored deployment streams the data about its health and performance so that the team can spot production incidents immediately. Combined with a Continuous Deployment Release Pipeline, monitoring will detect new anomalies and allow for prompt mitigation. This allows discovery of the “unknown unknowns” in application behavior that cannot be foreseen in pre-production environments. Effective monitoring is essential to allow DevOps teams to deliver at speed, get feedback from production, and increase customers satisfaction, acquisition and retention. Read more about the monitoring capabilities of Application Insights. Learn how to set up and use Application Insights for monitoring.